Whew! 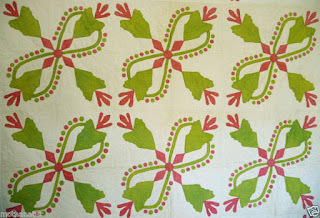 I made it through the whole month posting every day! 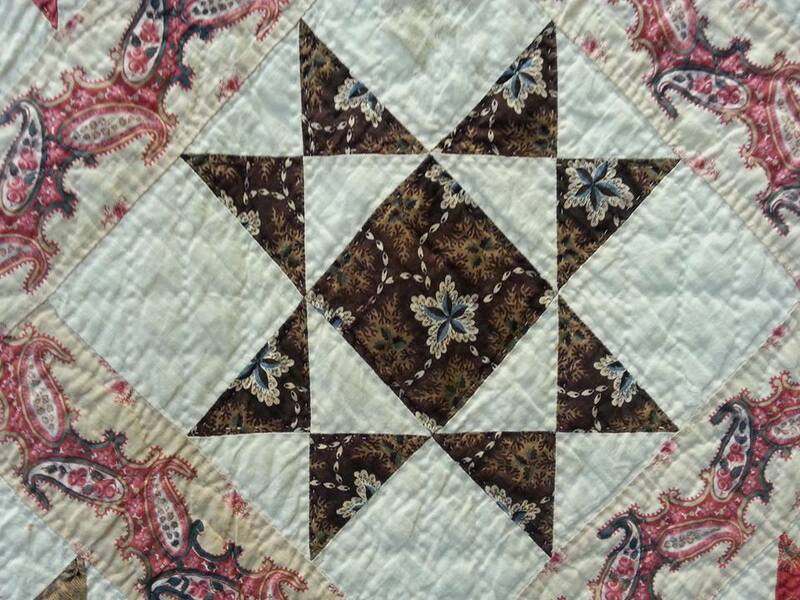 Ending the journey with STARS - my favorite pattern category. 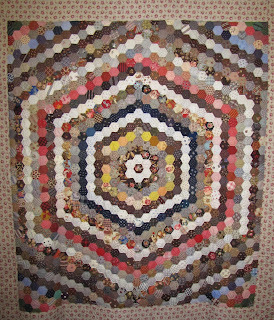 One of the best of the best applique wreath quilts. 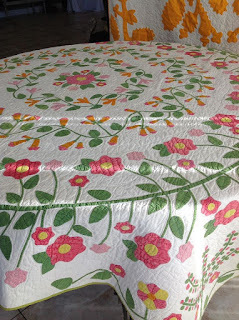 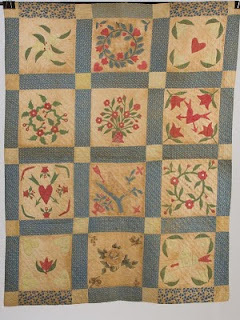 Part of the Starley Quilt Collection and headlining the Birds and Blooms trunk show and 1/2 day quilt study session too. 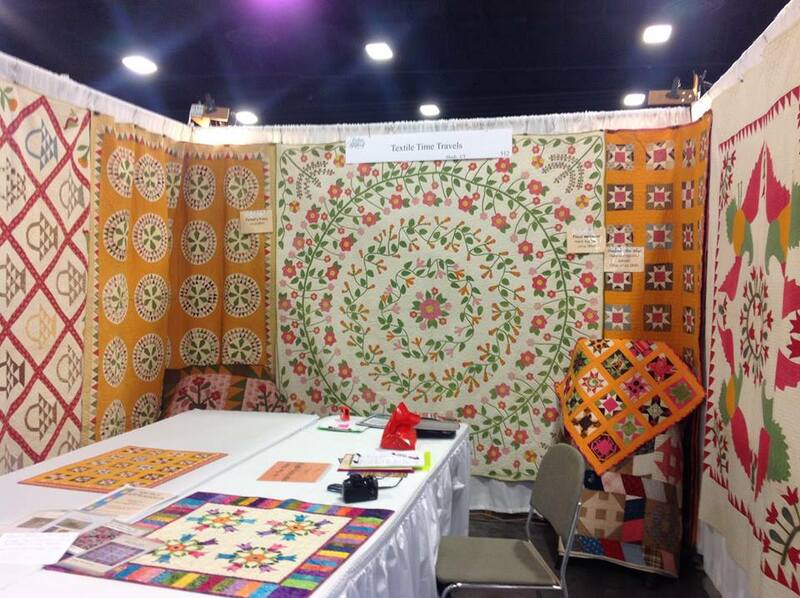 Would love to bring it to your quilt guild or show. 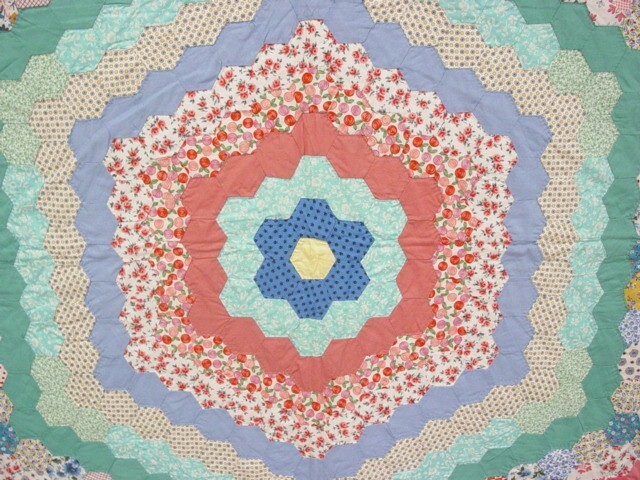 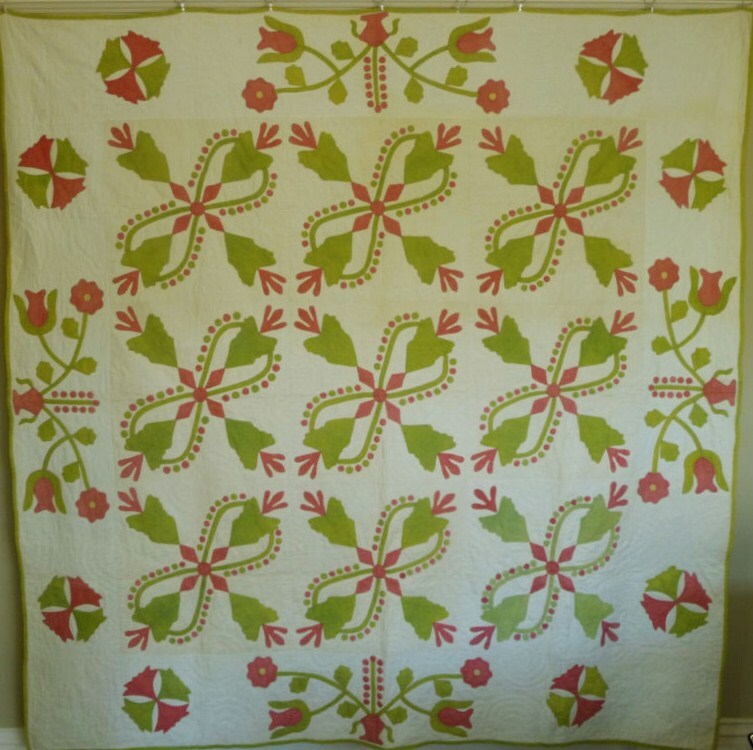 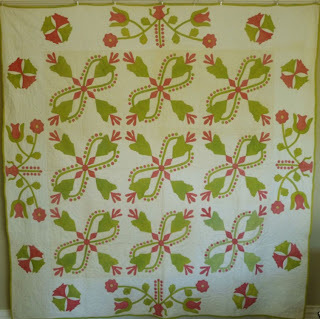 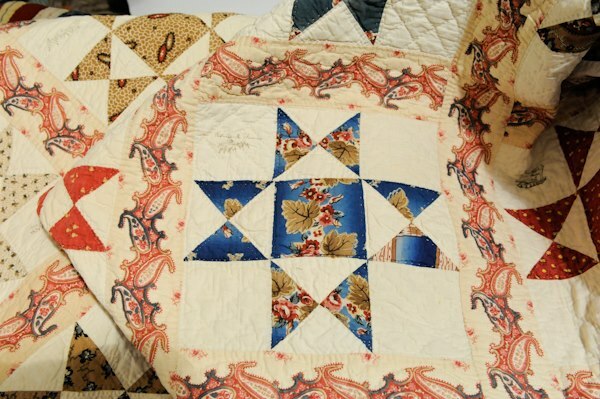 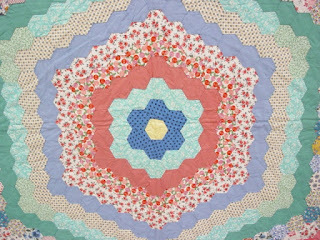 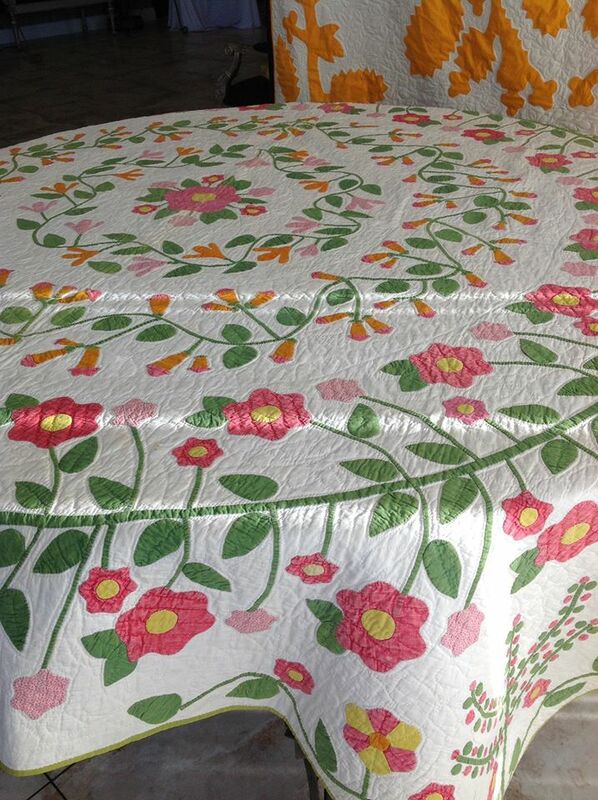 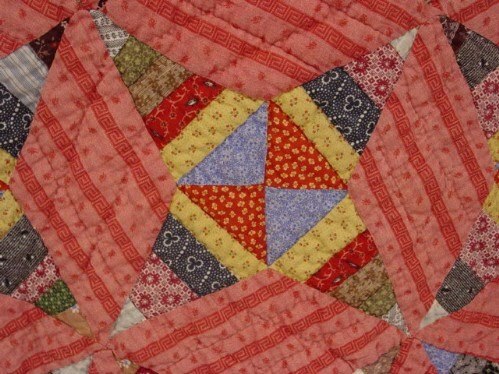 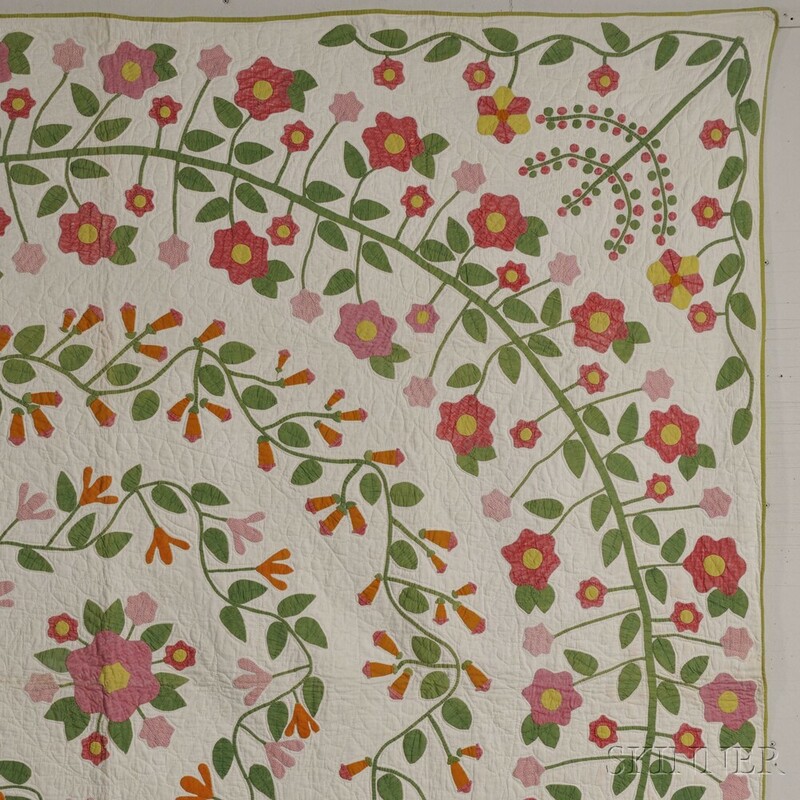 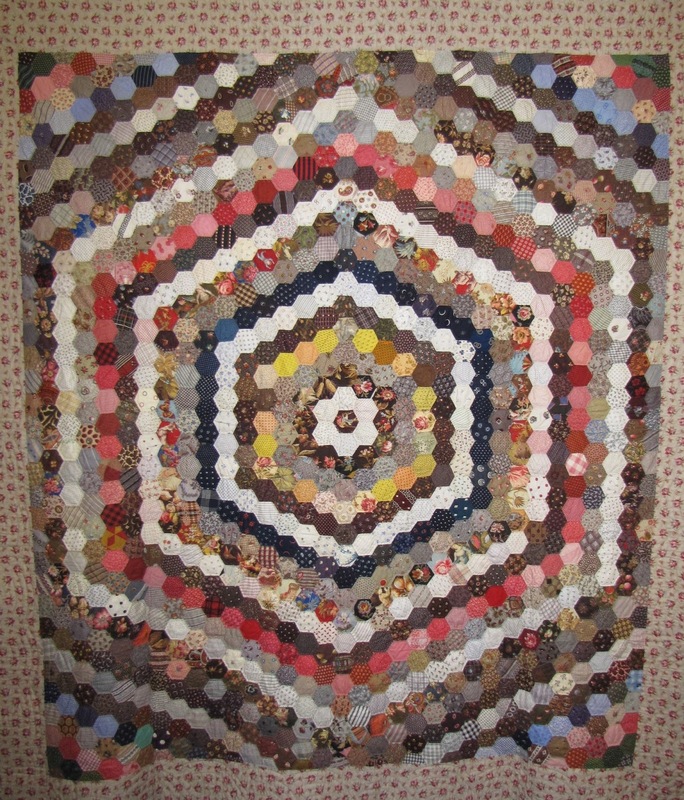 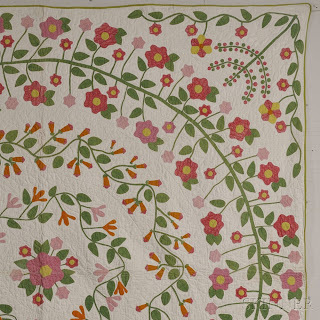 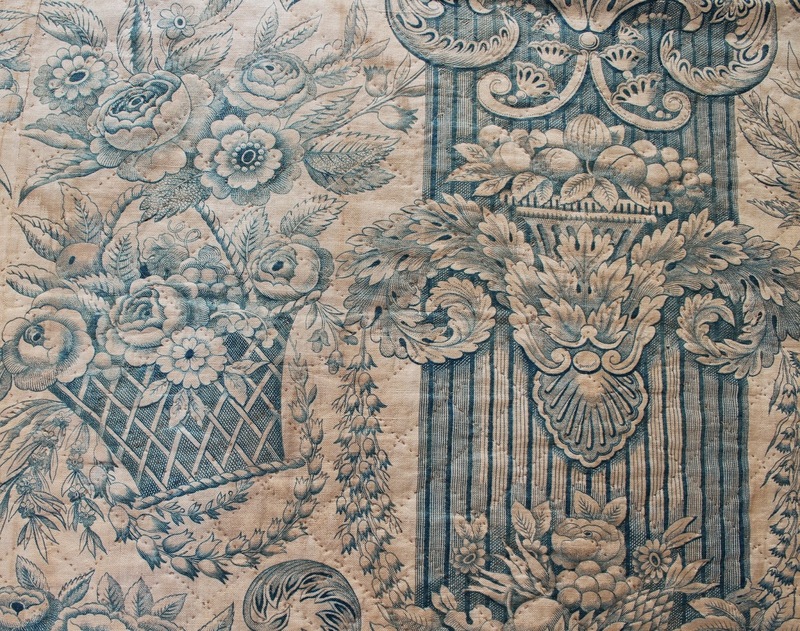 Circa 1850 antique applique wreath quilt along with more of the Starley quilt collection. 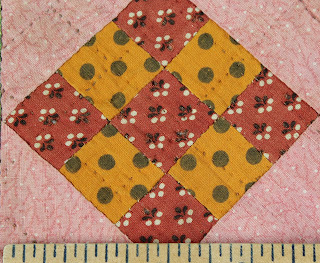 Love this delicate double 9 patch block. 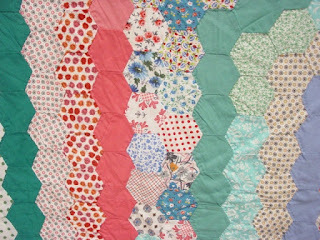 This year has definitely been a "Rocky Road" so it is a good block to post as we near the year end. 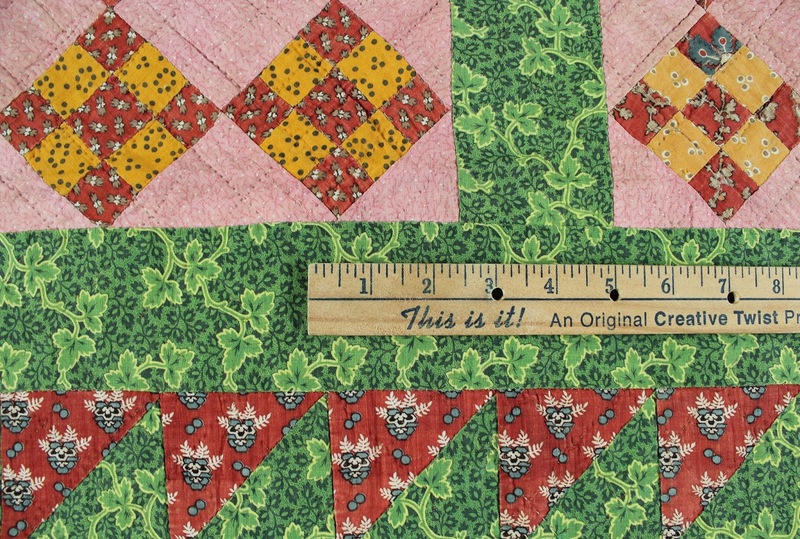 Detail of the amazing floral striped backing: a true neon print. 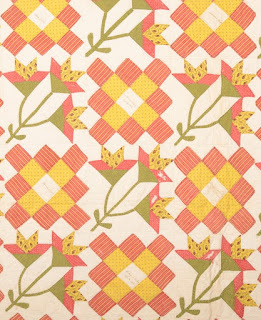 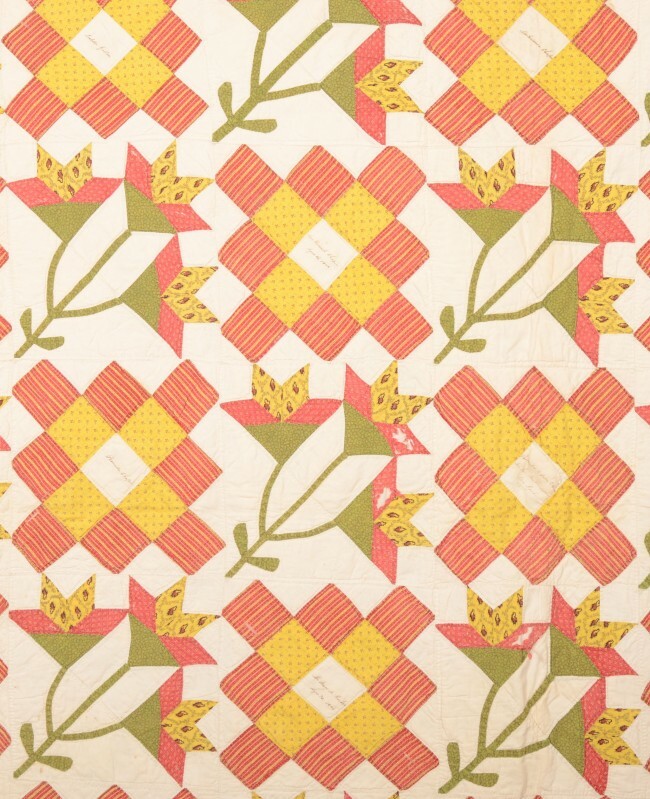 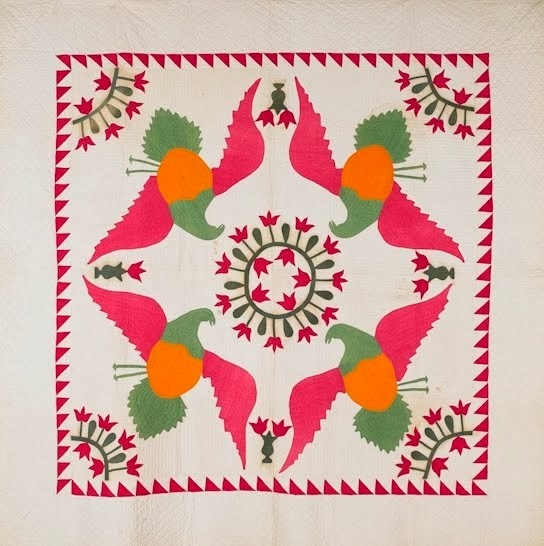 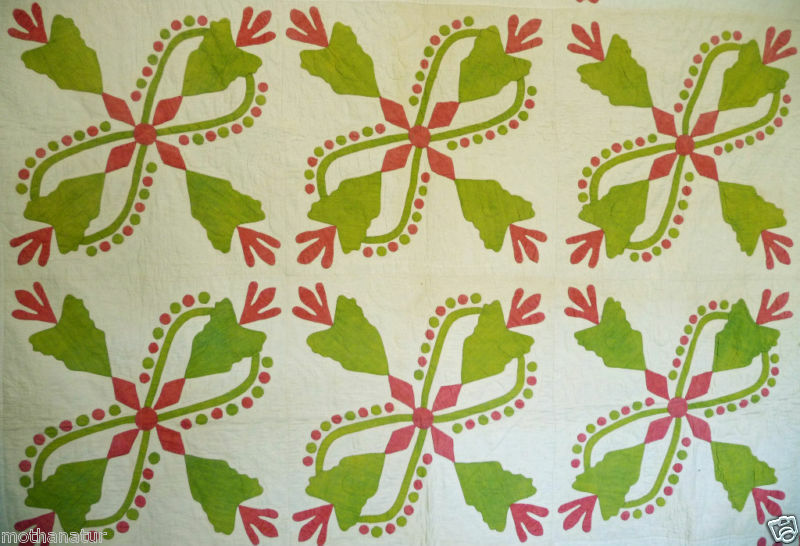 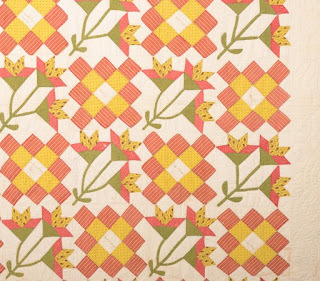 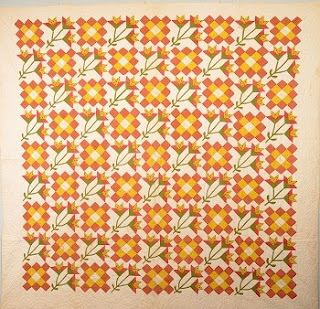 This block pattern is part of my Patterns Through Time lecture along with a 1930s version made by my great grandmother in Kanosh, Utah. 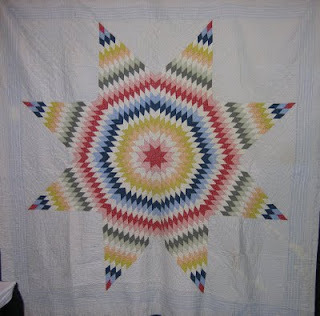 Here are both of them together. 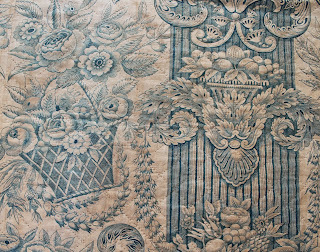 Another recent study pattern is Caesar's Crown- an intricate pattern, not for the faint of heart. 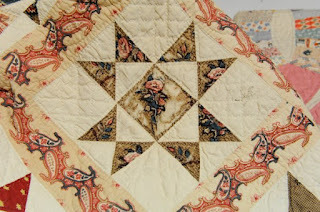 Most of the early versions are done by hand curved piecing NOT applique. 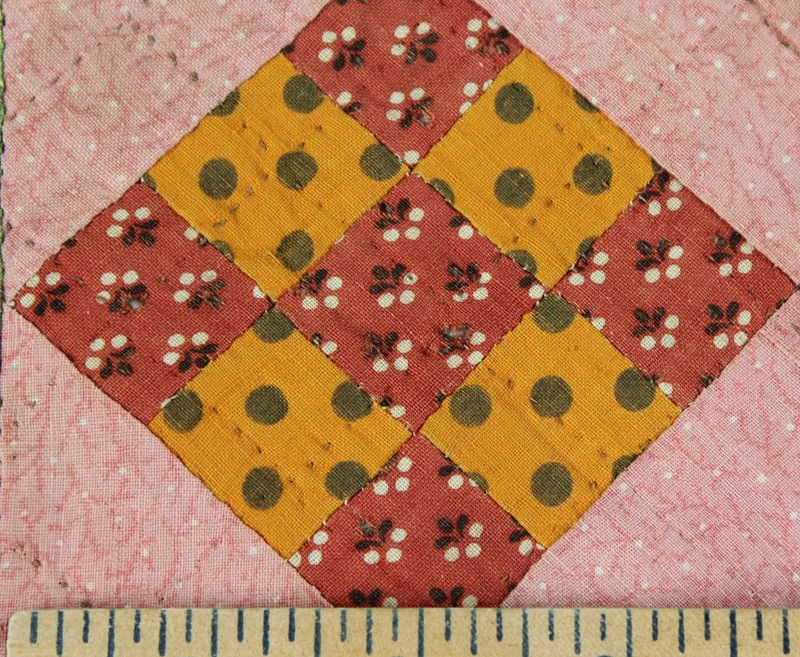 And while most signature album blocks are made with simple pieced blocks (Baltimore Album style not withstanding), this difficult pattern had some popularity as a signature album. 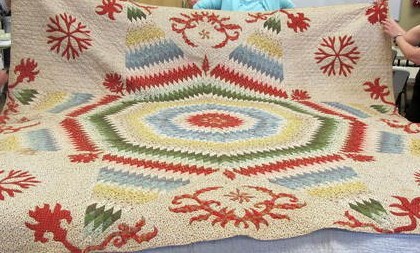 Merry Christmas - What could be more appropriate for Christmas than a Bethlehem Star with snow flakes and red and green too! 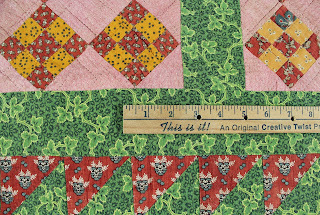 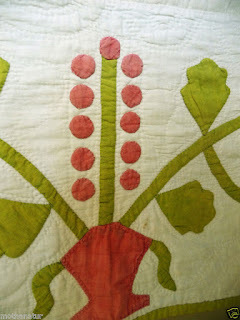 Detail from my antique reproduction quilt - the little flower basket is just an inch and a quarter! 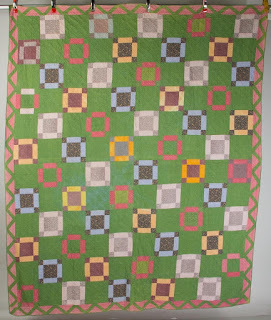 Most of my collection is from the 1800s but I do have a few quilts from the 1900s. 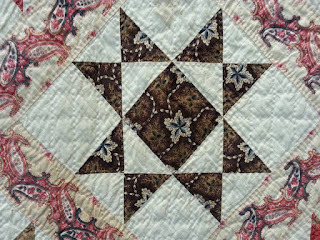 Generally, they are interesting graphic examples that I use to show how patterns change and stay the same through the centuries. 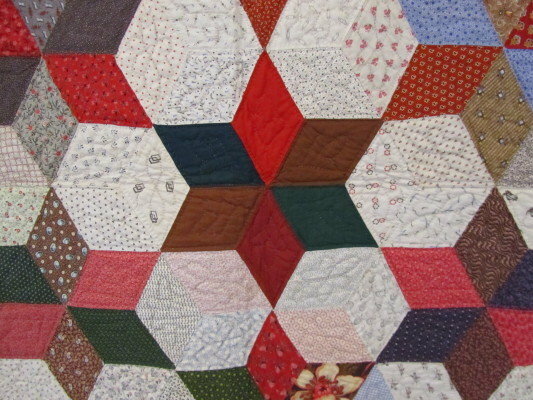 This hexagon and its older twin are beautiful examples for teaching quilt dating by comparing the same designs through time. 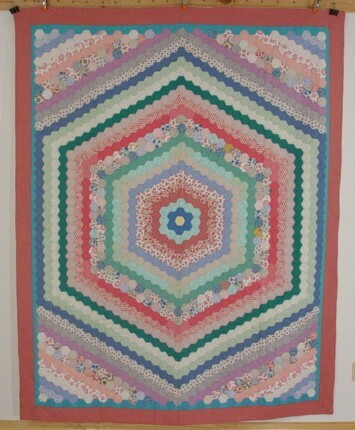 This hexagon medallion is c. 1950. 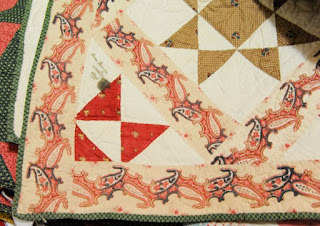 Scroll down to see the older twin example from about 1885. 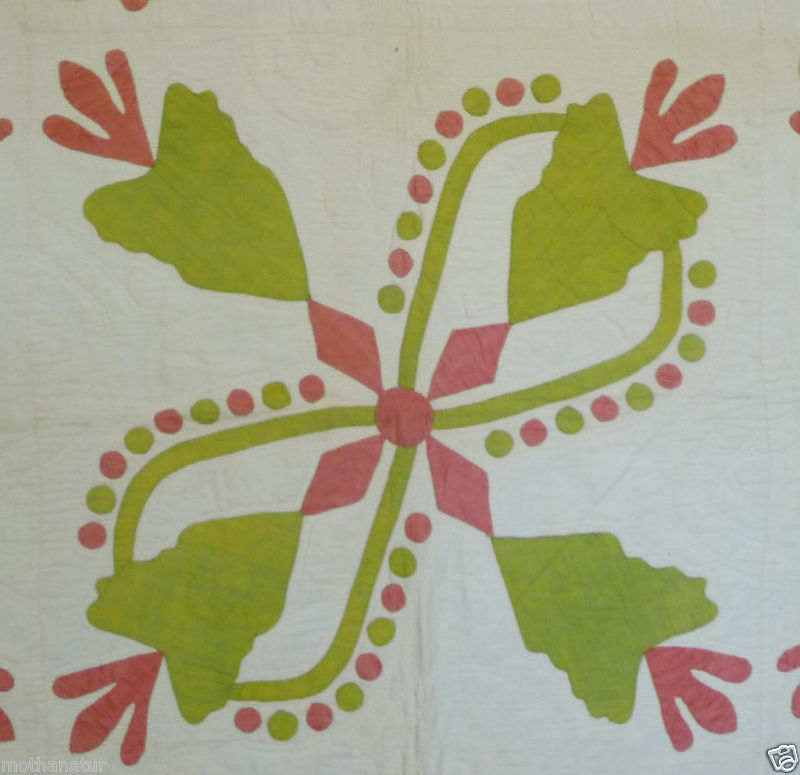 Detail of an unusual signature presentation quilt inscribed and dated: "Easton PA 1846. 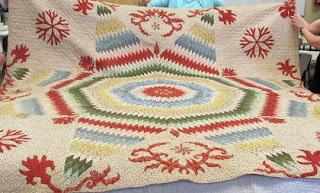 Presented to Solon Chapin by his Mother in law Mrs. Hocker 1846". 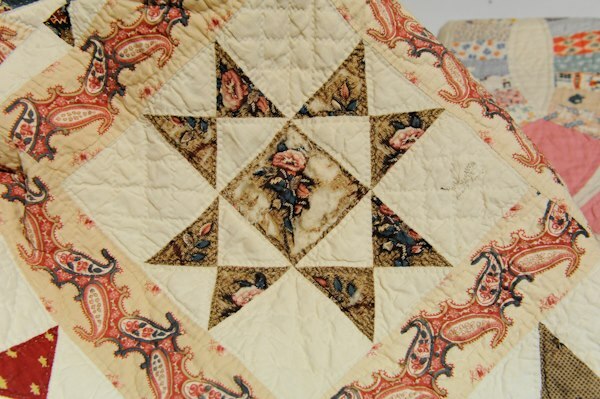 Solon was a famous bridge architect and lived in Easton Pennsylvania. 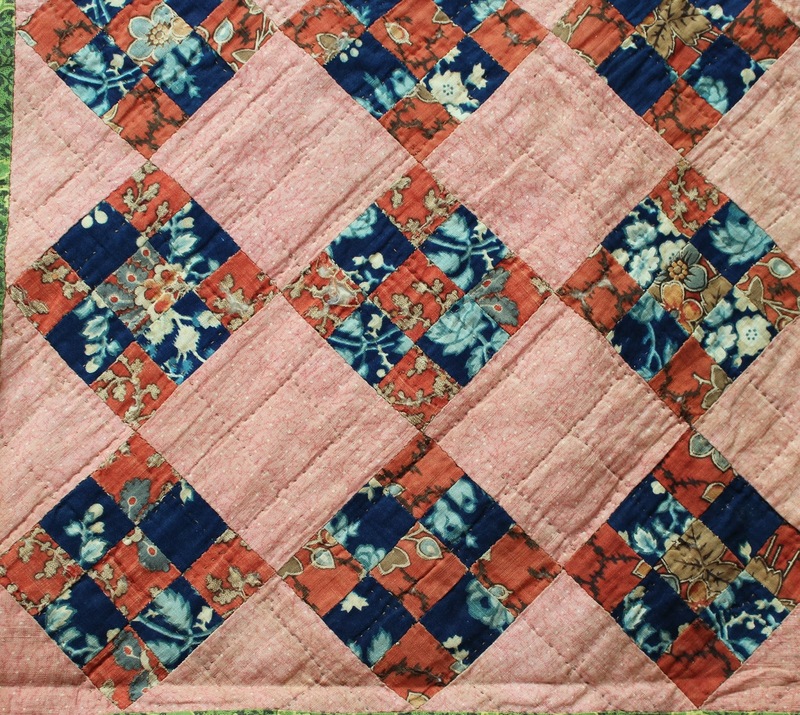 The chimney block (pieced squares) is a very common signature block but is very unusual to find it paired with a floral block. 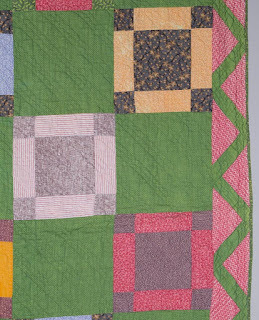 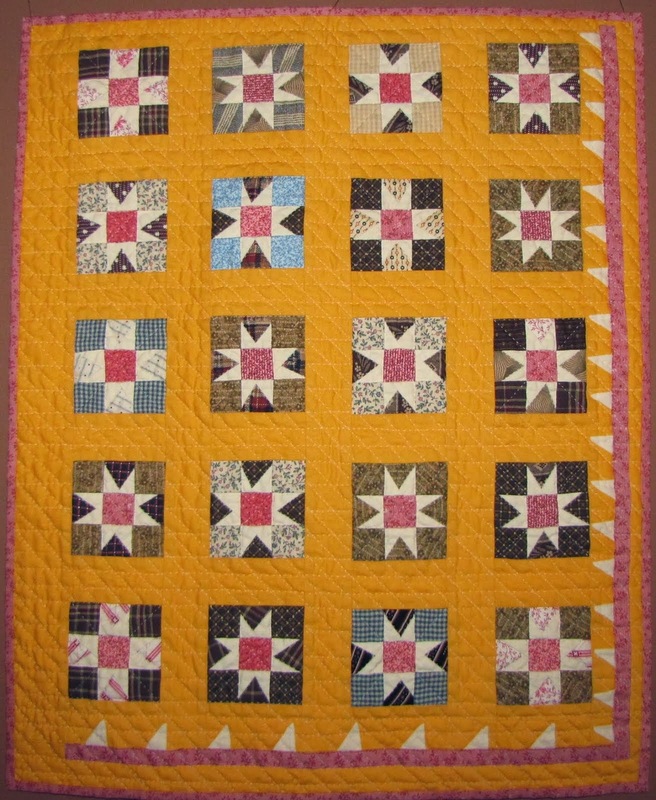 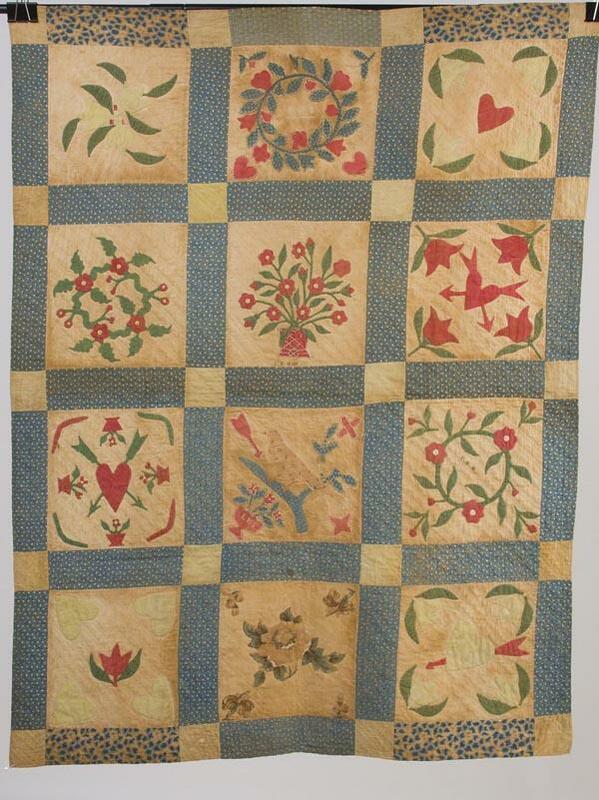 Here is a more standard version- also a signature quilt from across the river from Easton in New Jersey c. 1860. 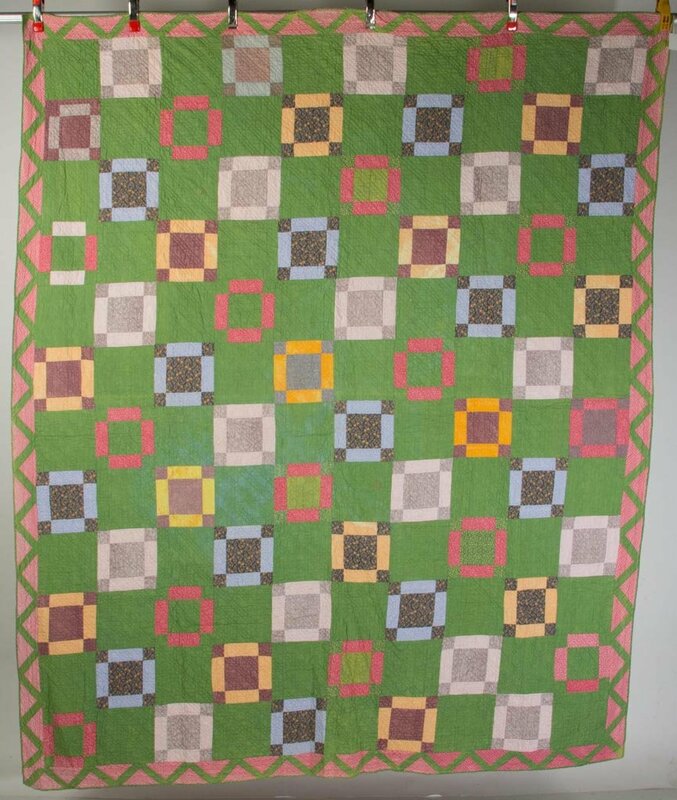 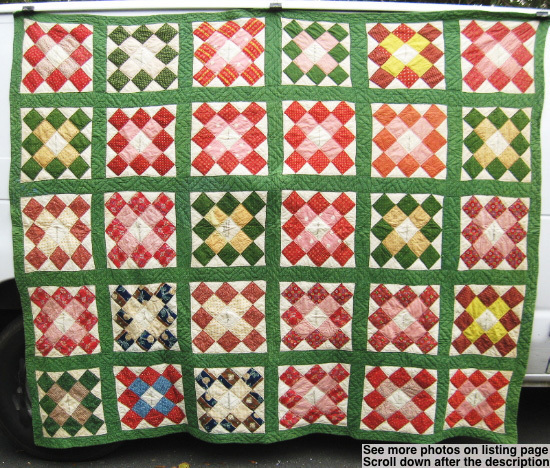 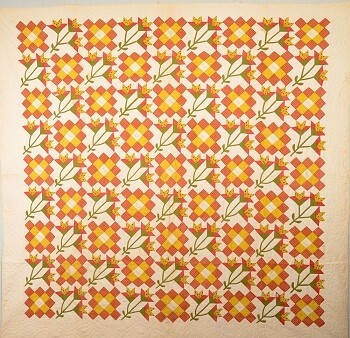 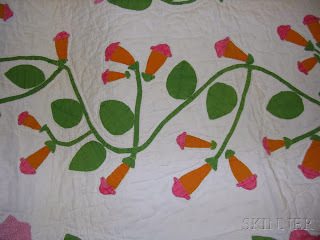 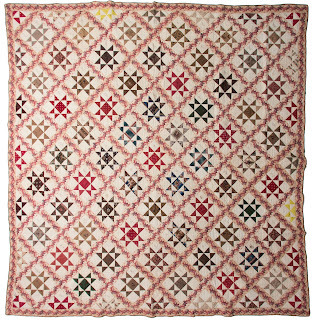 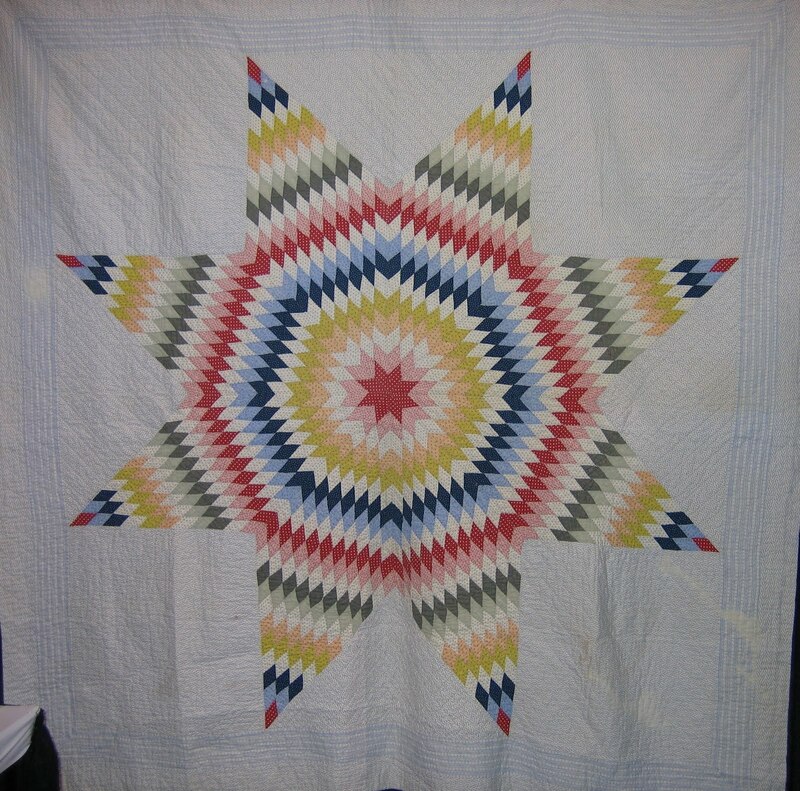 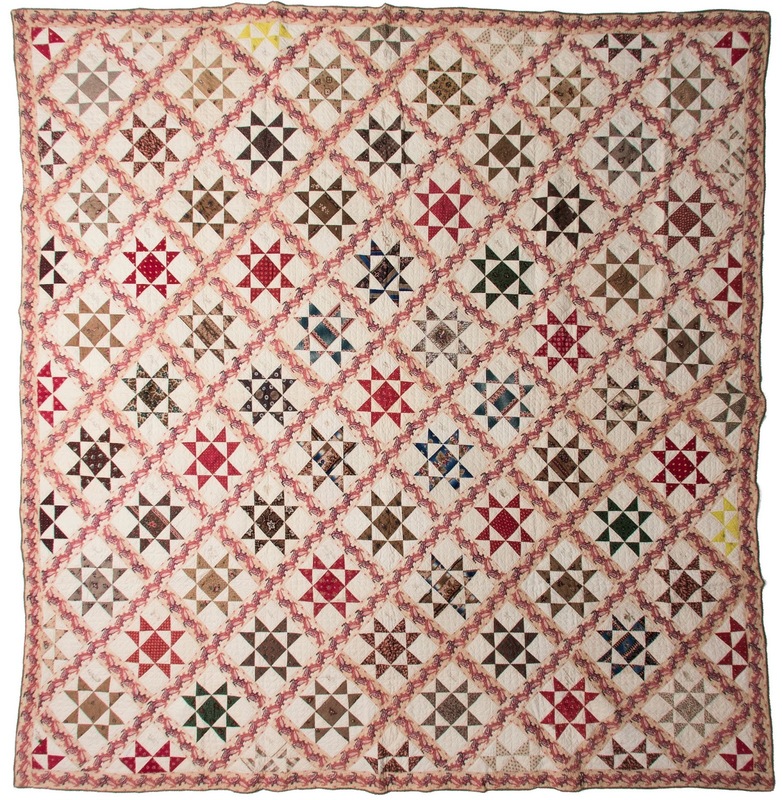 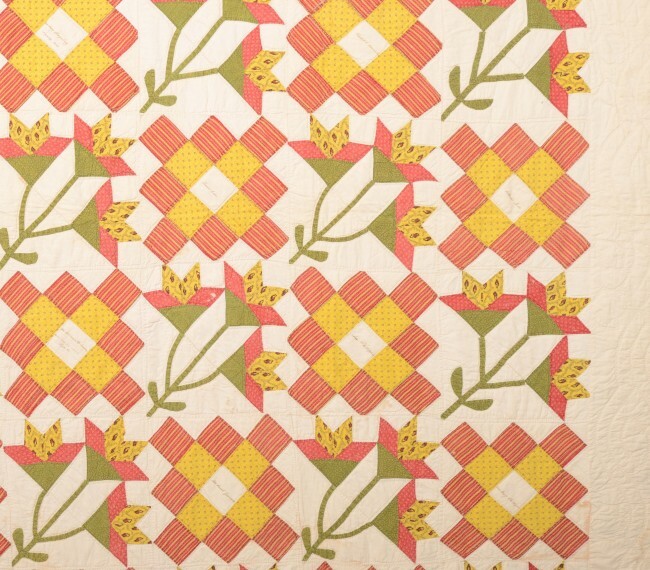 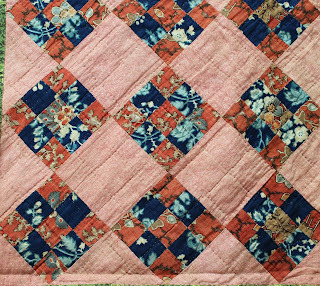 Very early signature quilt from Hunterdon Co, New Jersey. 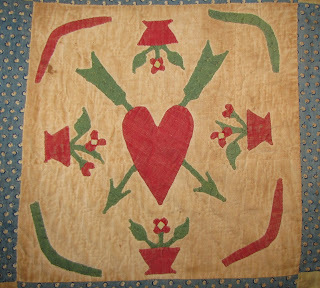 signed and dated 1843.